SkyRose Cattle Company may update or modify the Terms and Conditions at any time, without prior notice. By using this Site following any such change, you agree to be bound by the Terms and Conditions for this website as changed and we recommend you review the Terms and Conditions each time you visit the Site. All materials on this Site, including all images, text, logos, designs, icons, photographs, programs, and video or audio clips (collectively, the "Content"), are intended solely for personal, non-exclusive and non-commercial use. You may access, view, download, print or copy the Content for your personal, non-commercial use only; provided, however, that you (1) retain all copyright, trademark or other proprietary designations contained on all Content; (2) do not modify or alter the Content in any way; and (3) do not provide or make available the Content to any third party. No right, title or interest in any viewed, copied or downloaded Content is transferred to you as a result of your use of this Site. Except as noted above, you may not copy, download, reproduce, publish, transmit, distribute, display, modify, create derivative works from, or otherwise exploit in any way the Content or this Site without first obtaining written permission from SkyRose Cattle Company. SkyRose Cattle Company may terminate, change, suspend or discontinue any aspect of this Site, including the availability of any features of the Site, at any time and without notice. SkyRose Cattle Company also reserves the right to block or deny access to the Site to anyone at any time for any reason. 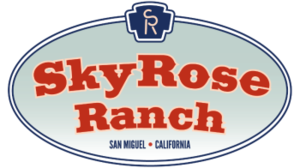 "SkyRose Cattle", "Serving California", and "SkyRose Ranch" logos appearing below, as well as related product and service names, design marks and slogans that may appear in this website, are or may become registered trademarks of SkyRose Cattle Company and/or its Affiliates and may not be used without permission. Unless otherwise noted, all Content is or will be protected as copyrights, trademarks, service marks, trade names or other intellectual property owned, controlled or licensed by SkyRose Cattle Company, one of its affiliates, or by third parties who have licensed their intellectual property to SkyRose Cattle Company and is or will become protected by U.S. and international intellectual property laws and treaty provisions. Unauthorized duplication is a violation of law. No rights in any Content, including any trademark, service mark or trade name, are granted to you in connection with your use of this Site. SkyRose Cattle Company and its affiliates and licensors expressly reserve all intellectual property rights in all Content. SkyRose Cattle Company has a no-tolerance policy regarding the use of our trademarks or names in metatags and/or hidden text. Specifically, the use of our trademarks or names in metatag keywords is or may be trademark infringement, and the use of trademarks or names in page text, metatags, and/or hidden text for purposes of gaining higher rankings from search engines is unfair competition. All comments, feedback, suggestions, ideas, and other submissions disclosed, submitted or offered to SkyRose Cattle Company or by the Site or otherwise disclosed, submitted or offered to SkyRose Cattle Company (collectively, "Comments") shall be and remain SkyRose Cattle Company property, which we may use for any purpose including commercial purposes. Such disclosure, submission or offer of any Comments shall constitute an assignment to SkyRose Cattle Company of all worldwide rights, titles and interests in all copyrights and other intellectual property in the Comments. SkyRose Cattle Company is and shall be under no obligation to maintain any Comments in confidence or to pay to user any compensation for any Comments. You agree that no Comments submitted by you to this Site will violate any right of any third party, including copyright, trademark, privacy or other personal or proprietary right(s). You are and shall remain solely responsible for the content of any Comments you make. Tampering with the Site, misrepresenting the identity of a user, using buying agents or conducting fraudulent activities on the Site are prohibited. Violations of system or network security may result in civil or criminal liability. SkyRose Cattle Company will investigate occurrences and may involve, and cooperate with, law enforcement authorities in prosecuting the user or users who are involved in such violations. You are prohibited from violating or attempting to violate the security of the Site, including, without limitation, the following: (a) accessing data not intended for such user or logging into a server or account which user is not authorized to access; (b) attempting to probe, scan or test the vulnerability of a system or network or to breach security or authentication measures without proper authorization; (c) attempting to interfere with service to any user, host or network, including, without limitation, via means of submitting a virus to the Site, overloading, "flooding", "mailbombing" or "crashing"; or sending unsolicited e-mail, including promotions and/or advertising of products or services, (d) reverse engineering any part of the Site, or (e) forging any TCP/IP packet header or any part of the header information in any e-mail or newsgroup posting. THIS SITE IS PROVIDED ON AN "AS IS" AND "AS AVAILABLE" BASIS. NEITHER SKYROSE CATTLE COMPANY NOR ITS AFFILIATES, SUBSIDIARIES OR DESIGNEES NOR EACH OF THEIR RESPECTIVE OFFICERS, DIRECTORS, EMPLOYEES, AGENTS, THIRD-PARTY CONTENT PROVIDERS, DESIGNERS, CONTRACTORS, DISTRIBUTORS, MERCHANTS, SPONSORS, LICENSORS, PREDECESSORS IN INTEREST, SUCCESSORS, ASSIGNS, OR THE LIKE (COLLECTIVELY, "ASSOCIATES" AND “AFFILIATES”) WARRANT THAT USE OF THE SKYROSE CATTLE COMPANY SITE WILL BE UNINTERRUPTED OR ERROR-FREE. NEITHER SKYROSE CATTLE COMPANY, NOR ITS ASSOCIATES OR AFFILIATES, WARRANTS THE ACCURACY, INTEGRITY OR COMPLETENESS OF THE CONTENT PROVIDED ON THE SKYROSE CATTLE COMPANY SITE OR THE PRODUCTS OR SERVICES OFFERED FOR SALE ON THE SKYROSE CATTLE COMPANY SITE. FURTHER, SKYROSE CATTLE COMPANY MAKES NO REPRESENTATION THAT CONTENT PROVIDED ON ITS SITE IS APPLICABLE TO, OR APPROPRIATE FOR USE IN, LOCATIONS OUTSIDE OF THE UNITED STATES. SKYROSE CATTLE COMPANY AND ITS ASSOCIATES AND AFFILIATES SPECIFICALLY DISCLAIM ALL WARRANTIES, WHETHER EXPRESSED OR IMPLIED, INCLUDING BUT NOT LIMITED TO WARRANTIES OF TITLE, MERCHANTABILITY OR FITNESS FOR A PARTICULAR PURPOSE. NO ORAL ADVICE OR WRITTEN INFORMATION GIVEN BY SKYROSE CATTLE COMPANY OR ITS ASSOCIATES OR AFFILIATES SHALL CREATE A WARRANTY. SOME STATES DO NOT ALLOW THE EXCLUSION OR LIMITATION OF CERTAIN WARRANTIES, SO THE ABOVE LIMITATION OR EXCLUSION MAY NOT APPLY TO YOU. UNDER NO CIRCUMSTANCES SHALL SKYROSE CATTLE COMPANY OR ITS ASSOCIATES OR AFFILIATES BE LIABLE FOR ANY DIRECT, INDIRECT, INCIDENTAL, SPECIAL OR CONSEQUENTIAL DAMAGES THAT RESULT FROM YOUR USE OF OR INABILITY TO USE THE SITE, INCLUDING BUT NOT LIMITED TO RELIANCE BY YOU ON ANY INFORMATION OBTAINED FROM THE SITE THAT RESULTS IN MISTAKES, OMISSIONS, INTERRUPTIONS, DELETION OR CORRUPTION OF FILES, VIRUSES, DELAYS IN OPERATION OR TRANSMISSION, OR ANY FAILURE OF PERFORMANCE. THE FOREGOING LIMITATION OF LIABILITY SHALL APPLY IN ANY ACTION, WHETHER IN CONTRACT, TORT OR ANY OTHER CLAIM, EVEN IF AN AUTHORIZED REPRESENTATIVE OF SKYROSE CATTLE COMPANY HAS BEEN ADVISED OF OR SHOULD HAVE KNOWLEDGE OF THE POSSIBILITY OF SUCH DAMAGES. THE USER HEREBY ACKNOWLEDGES THAT THIS LIMITATION OF LIABILITY SHALL APPLY TO ALL CONTENT, MERCHANDISE AND SERVICES AVAILABLE THROUGH THE SKYROSE CATTLE COMPANY SITE. SOME STATES DO NOT ALLOW THE EXCLUSION OR LIMITATION OF INCIDENTAL OR CONSEQUENTIAL DAMAGES, SO THE ABOVE LIMITATION OR EXCLUSION MAY NOT APPLY TO YOU. We hope to make you a happy and satisfied customer, but if there's a dispute that cannot be resolved by a telephone call or email, this section outlines what's expected of both of us. a. You Agree to Provide SkyRose Cattle Company an Opportunity Informally to Resolve Your Dispute. We hope that any disputes can be resolved amicably. However, before you may pursue or participate in any dispute (or raise such dispute as a defense) in court or arbitration against SkyRose Cattle Company or its Associates or Affiliates for any claims, including claims related in any way to SkyRose Cattle Company products, these Terms and Conditions, billing, privacy, advertising, or SkyRose Cattle Company's or its Associates' or Affiliates’ communications with you, you must first send a written description of your claim to: Legal Dept., SkyRose Cattle Company, 22917 Pacific Coast Highway, Suite 300, Malibu, CA 90265, and you must allow SkyRose Cattle Company a reasonable opportunity to resolve your dispute. Your written notice must describe the problem in reasonable detail, and identify or enclose all relevant documents and information. You and SkyRose Cattle Company agree to negotiate in good faith with each other to try to resolve your claim. If you and SkyRose Cattle Company do not reach a resolution of your dispute within sixty (60) days after SkyRose Cattle Company receives your written notice of claim, you may pursue your claim in arbitration or, solely to the extent specifically provided below, in court. b. Arbitration. You and SkyRose Cattle Company agree to arbitrate all disputes between the parties, except as provided in this subsection (b). Arbitration is more informal than a lawsuit in court. Arbitration uses a neutral arbitrator instead of a judge or jury, allows for more limited discovery than in court, and is subject to very limited review by courts. Arbitrators can award the same damages and relief that a court can award. This arbitration agreement covers any dispute arising out of or relating to any aspect of the relationship between us, whether based in contract, tort, statute, fraud, misrepresentation or any other legal theory, even if the claim arises or may arise before or after the term. For purposes of this arbitration provision, references to "SkyRose Cattle Company" and "us" includes our Affiliates and Associates. This agreement evidences a transaction in interstate commerce, and the Federal Arbitration Act governs the interpretation and enforcement of this provision. Notwithstanding the arbitration agreement set forth in the prior paragraph, if you fail to pay in full any amounts you owe us when they are due, SkyRose Cattle Company may assign your account for collection, and SkyRose Cattle Company and/or the collection agency may pursue in court claims limited to the collection of past due amounts and any interest or cost of collection permitted by law or these Terms. (However, SkyRose Cattle Company disclaims any and all liability, and you relieve SkyRose Cattle Company from any and all liability, with respect to the conduct of any such collection agency.) In addition, SkyRose Cattle Company may seek injunctive relief in any court with respect to any violation of the patent, trademark, service mark, copyright, trade secret, and/or other intellectual property rights of SkyRose Cattle Company or of any third party. YOU MAY CHOOSE TO PURSUE YOUR CLAIM IN COURT AND NOT BY ARBITRATION if: (i) your claim qualifies for small claims court in a location where jurisdiction and venue over you and SkyRose Cattle Company is proper, in which case you may initiate proceedings in small claims court; or (ii) YOU OPT OUT OF THESE ARBITRATION PROCEDURES WITHIN THIRTY (30) DAYS FROM THE DATE YOU FIRST ACCESS OR OTHERWISE USE THIS SITE OR ANY INFORMATION OR MATERIALS CONTAINED ON THE SITE (THE "OPT-OUT DEADLINE"). You may opt out by calling SkyRose Cattle Company's customer service department, toll-free, at 1-800-434-1369, before the Opt-Out Deadline. Either you or SkyRose Cattle Company may start an arbitration proceeding by sending to the other, by certified mail, a letter requesting arbitration ("Demand"). If you start the arbitration, you must send the Demand to the SkyRose Cattle Company Legal Dept., 22917 Pacific Coast Highway, Suite 300, Malibu, CA 90265. The Demand must (i) describe the nature and basis of the claim or dispute, and (ii) set forth the relief sought. The American Arbitration Association's ("AAA") Commercial Arbitration Rules and the Supplementary Procedures for Consumer-Related Disputes (collectively, the "AAA Rules"), as modified by these Terms and Conditions, will govern the arbitration. The AAA Rules are available online at www.adr.org, or by calling the AAA at 1-800-778-7879. If your claim is for $10,000 or less, we agree that you may choose whether the arbitration will be conducted solely on the basis of documents submitted to the arbitrator, through a telephonic hearing, or by an in-person hearing under the AAA Rules. If your claim exceeds $10,000, the right to a hearing will be determined by the AAA Rules. Regardless of the manner in which the arbitration is conducted, the arbitrator shall issue a reasoned written decision sufficient to explain the essential findings and conclusions on which the award is based. Upon you or SkyRose Cattle Company filing an arbitration demand, SkyRose Cattle Company will pay all filing, administration, and arbitrator fees, unless your claim exceeds $75,000. If you initiate an arbitration in which you seek more than $75,000 in damages, the AAA rules will govern the payment of these fees. All issues are for the arbitrator to decide, except that issues relating to the scope and enforceability of the arbitration provision are for a court to decide. Unless SkyRose Cattle Company and you agree otherwise in writing, any arbitration hearings will take place in the County of Los Angeles, State of California. One arbitrator, who is selected under the AAA Rules and who has expertise in consumer disputes in the food industry, will conduct the arbitration. If no arbitrator possessing such expertise is available, then the arbitration will be conducted by a single arbitrator who is selected by the mutual written approval of you and SkyRose Cattle Company. The decisions of the arbitrator will be binding and conclusive on all parties. Judgment upon any award of the arbitrator may be entered by any court of competent jurisdiction. This provision will be specifically enforceable in any court. THE ARBITRATOR MUST FOLLOW THIS AGREEMENT AND CAN AWARD THE SAME DAMAGES AND RELIEF AS A COURT (INCLUDING ATTORNEYS' FEES). You or SkyRose Cattle Company must bring any claim arising out of or related to these Terms and Conditions or our relationship within one (1) year after the claim arises, or the claim will be permanently barred. To the extent the law applicable under subsection (b) of these Terms and Conditions makes this limitation period unenforceable with respect to any claim(s), then the statutes of limitations of the State whose laws govern these Terms and Conditions under subsection (b) shall apply. YOU AND SKYROSE CATTLE COMPANY AGREE THAT ANY DISPUTE RESOLUTION PROCEEDINGS WILL BE CONDUCTED ONLY ON AN INDIVIDUAL BASIS AND NOT IN A CLASS OR REPRESENTATIVE ACTION. NEITHER YOU NOR SKYROSE CATTLE COMPANY SHALL BE A MEMBER IN A CLASS, CONSOLIDATED, OR REPRESENTATIVE ACTION OR PROCEEDING, AND THE ARBITRATOR MAY AWARD RELIEF ONLY IN FAVOR OF THE INDIVIDUAL PARTY SEEKING RELIEF AND ONLY TO THE EXTENT NECESSARY TO PROVIDE RELIEF WARRANTED BY THAT PARTY'S INDIVIDUAL CLAIM. IF YOU TIMELY OPT OUT OF THE ARBITRATION PROVISION IN THE MANNER DESCRIBED ABOVE, THEN THE WAIVER OF THE RIGHT TO PARTICIPATE IN A CLASS ACTION WILL NOT APPLY TO YOU. SKYROSE CATTLE COMPANY DOES NOT CONSENT TO CLASS ARBITRATION; ACCORDINGLY, IF A COURT REFUSES TO ENFORCE THIS SUBSECTION (b), THEN THE AGREEMENT TO ARBITRATE SHALL BE UNENFORCEABLE AS TO YOU. WHETHER A CLAIM PROCEEDS IN COURT OR IN ARBITRATION, YOU AND SKYROSE CATTLE COMPANY HEREBY WAIVE ANY RIGHT TO A JURY TRIAL. c. Governing Law. The Terms and Conditions, and any disputes arising between you and SkyRose Cattle Company related in any way to the Terms and Conditions or SkyRose Cattle Company's products, including but not limited to disputes over billing, service, privacy, advertising, or SkyRose Cattle Company's or its Associates' or Affiliates’ communications with you, whether based on contract, tort, statute, or common law, will be governed by the laws of the State of California, without regard to conflict of law principles. While SkyRose Cattle Company strives to provide accurate product and pricing information, unintentional pricing or typographical errors may occur. SkyRose Cattle Company reserves the right to correct any errors, inaccuracies or omissions and to change or update information (including, without limitation, information related to text, pricing, availability and product descriptions) at any time without notice (including after you submitted your order and confirmation was received). In the event that an item is listed at an incorrect price or with incorrect information, SkyRose Cattle Company shall have the right, in its sole discretion, to refuse or cancel any purchased orders placed for that item. If your credit card has been charged for any order subsequently cancelled, SkyRose Cattle Company will issue a credit to your credit card. Individual bank policies will dictate when this amount is credited to your account. We apologize for any inconvenience this may cause you. Prices and availability of products offered by SkyRose Cattle Company are subject to change without notice. If you are not fully satisfied with your purchase, you may refer to our Guarantee on the Site. SkyRose Cattle Company may, in its sole discretion, terminate your account or your use of the Site at any time. You are personally liable for any orders that you place or charges that you incur prior to termination. If you are a copyright owner or an agent thereof and believe that any content, information, or communication on the Site infringes upon your copyrights, you may submit a written notice of infringement pursuant to the Digital Millennium Copyright Act, 17 U.S.C. § 512 (the "DMCA"). All notices of infringement should be sent to the designated agent of SkyRose Cattle Company identified below and should include the following information: (a) an electronic or physical signature of the copyright owner or of the person authorized to act on behalf of the owner of the copyright interest, (b) a description of the copyrighted work that you claim has been infringed, (c) a description of where the material that you claim is infringing is located on the Site, (d) your address, telephone number, and e-mail address, (e) a written statement by you that you have a good faith belief that the disputed use is not authorized by the copyright owner, its agent, or the law, and (f) a statement by you, made under penalty of perjury, that the above information in your notice is accurate and that you are the copyright owner or authorized to act on the copyright owner's behalf. © SkyRose Cattle Company, LLC, 2015. All Rights Reserved.